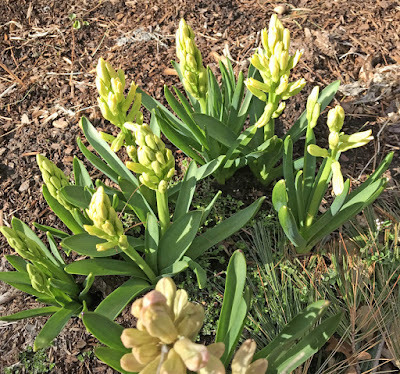 The pinks, the whites, the lavenders along with the greens are popping up in our back perennial garden! What a welcome sight! 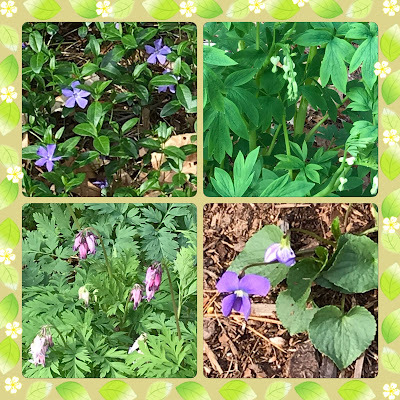 Enjoying the beautiful colors of Spring is always a treat after the snow disappears. Our weather is a bit warmer now, so the blossoms are here. It's so very cool that so many shades of color are now found in our yard. The sky is overcast and the raindrops have started to come down. 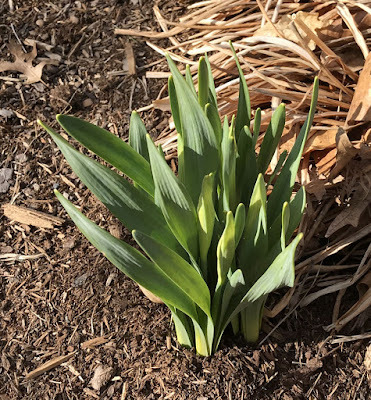 But, a quick look outdoors is proof that Spring is here. The color of the day is YELLOW!! It's a great sight to view the Forsythia bushes this year. Last year the long branches only had green leaves. This year we can see the flowers, first. Roasted and ready to enjoy! 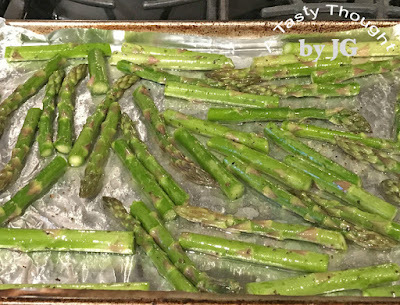 Roasting is definitely my favorite way to prepare Asparagus! I've enjoyed this veggie for literally decades. 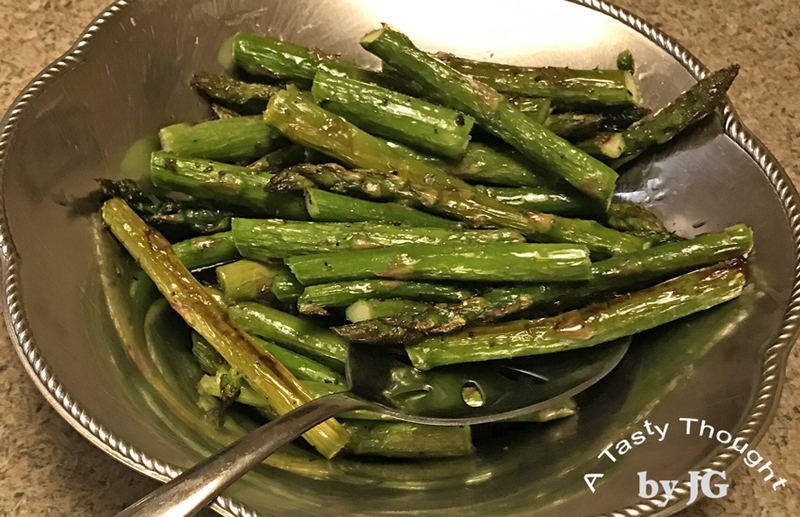 Growing up next door to the town of Hadley in MA, Asparagus was always served at least 3 times a week in the Spring while the local Hadley crop was sold at the road side stands. As time has moved on, I no longer boil the fresh stalks and serve with drizzled butter. That was how it was prepared before being placed on the dinner table- so many years ago. My "go to" method these days is roasting it. My Spice Rack comes in handy here! The stalks are cut in half and combined with Olive Oil, Garlic Powder, Basil and Oregano before placing them on a cookie sheet. Roast 12- 13 minutes in a 425°F oven. It's that quick! It's so yummy! Cut off tough ends (about 1 and 1/2") and toss from bottom end of Asparagus stalks. Cut each stalk in half. Double rinse in cold water and drain. Toss Asparagus with Olive Oil, Garlic Powder, Basil and Oregano. Place each piece on foil lined cookie pan in a single layer. Roast in a preheated 425°F oven for 12- 13 Minutes. An easy tasty veggie that is quick to prepare for dinner! Our perennial gardens are beginning to come alive! 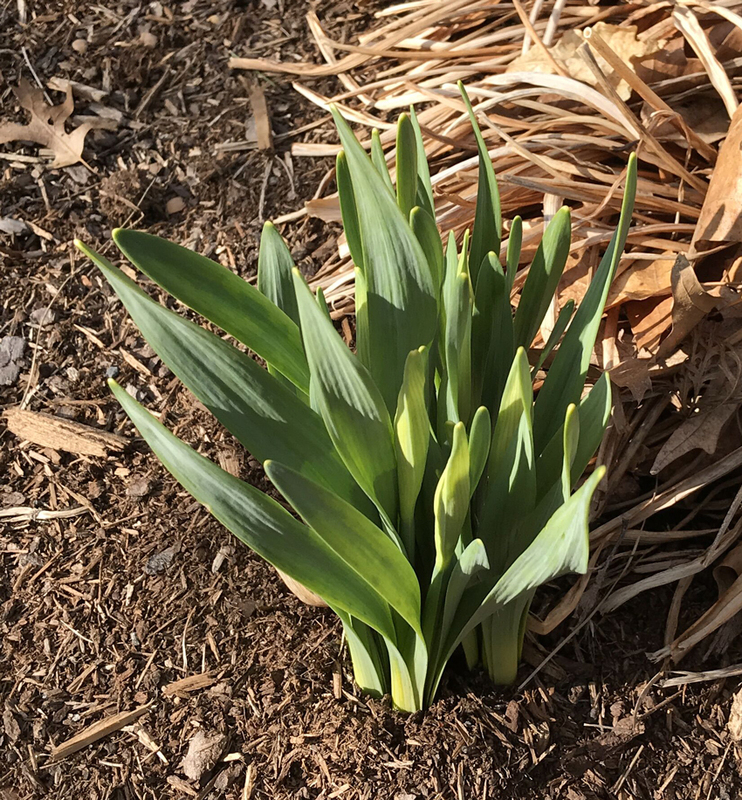 The Rose Bushes survived the cold winter and the Salmon Daylilies are beginning to sprout. 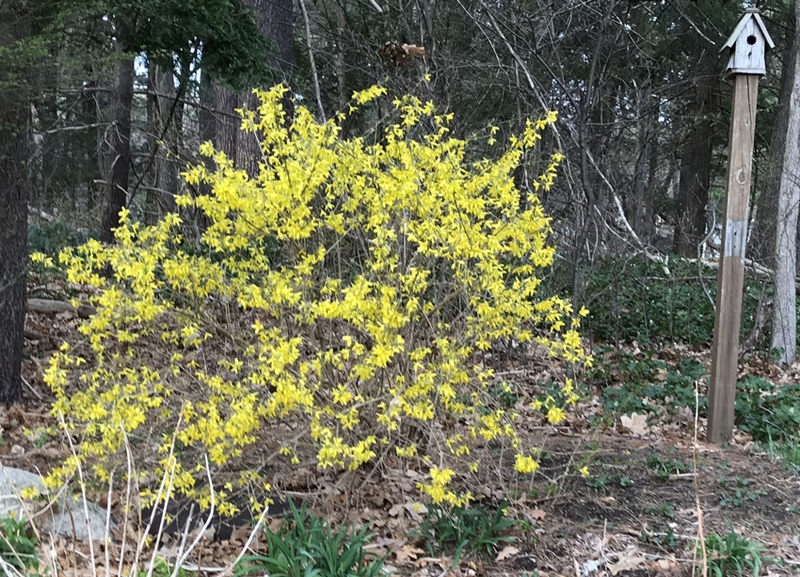 Forsythia Bushes have small buds and the Hydrangea looks like new shoots are coming out. It's interesting to watch the flowers as they begin to grow and then blossom. 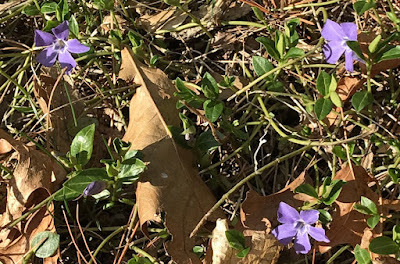 These dainty Vinca flowers are much smaller than the dried Oak leaves. 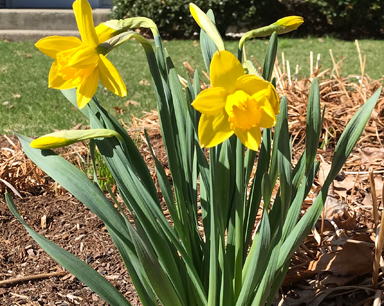 A great surprise has been the clump of Daffodils! Last year they did not make an appearance. Wondering what color they will be! 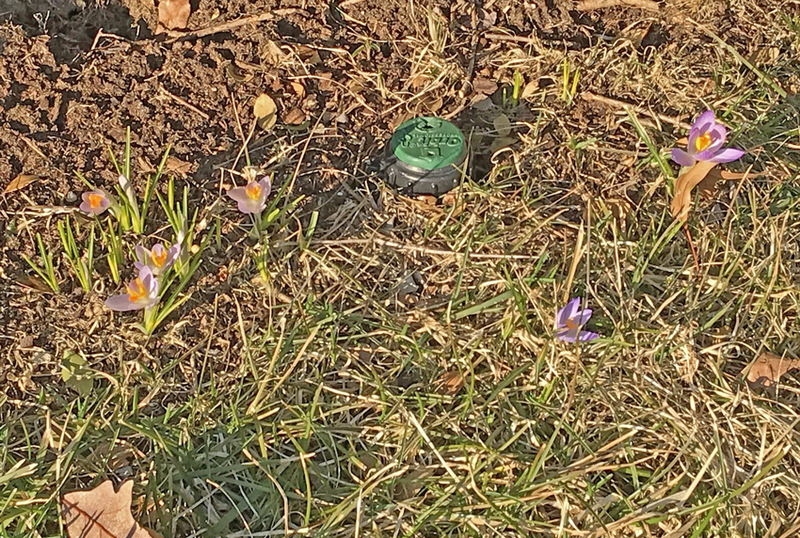 This afternoon after doing errands, I checked out the status of our Crocuses. I've been watching their growth for the past 2 weeks. 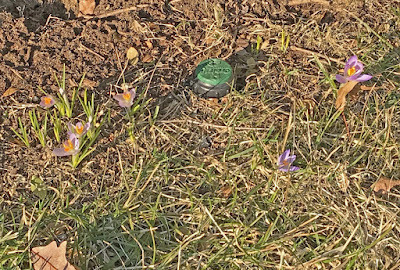 Little green sprouts that did survive the snow. Today- Surprise! Perfect timing on the 1st day of Spring! 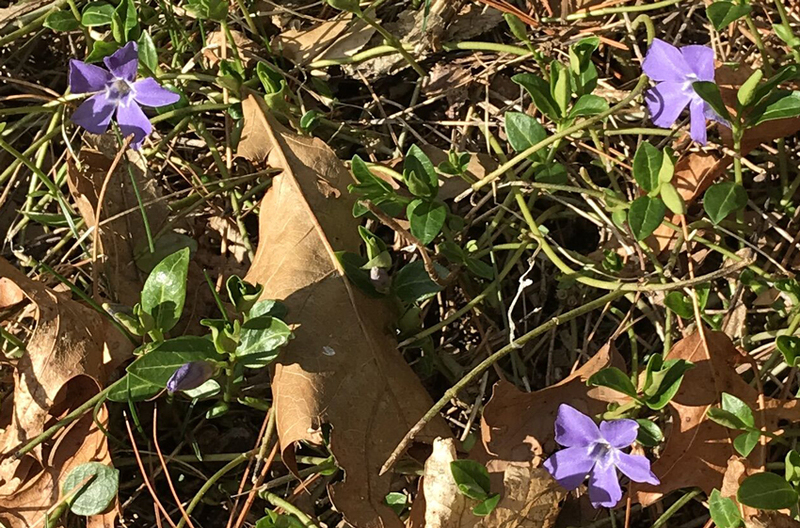 Today, in a different area, lavender flowers were visible! It's that time of year when everyone is Irish!! St. Patrick's Day is approaching. Me? I'm Irish by marriage and yes, it does count as being Irish! 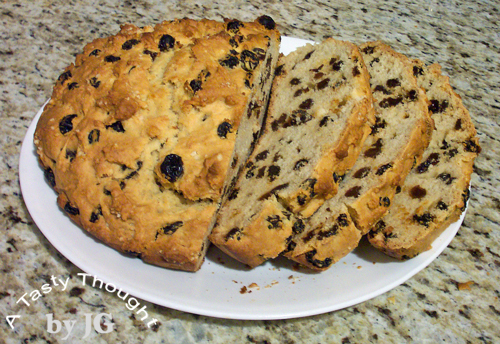 For that reason I always bake an Irish Soda Bread for us to enjoy. Usually I bake it a day or two before March 17. I had tried different recipes over the years. The results were, well, too dry. Then, I hit the jackpot one year. I discovered it by googling. It was on another foodie blog. This is the best Irish Soda Bread that I've ever baked/ tasted!! The Irish Soda Bread was made using Buttermilk, Butter and Raisins that were first soaked in hot water. There was no need to spread any additional butter (flavored or not) on top before eating. Heating a slice of this scrumptious bread in the microwave for a few seconds results in a warm "melt in your mouth" slice of bread! Double yum here!! One year in my haste of preparing it, I melted the Butter, first. That proved to be a good move!! The dough comes together much easier using cooled, melted Butter. Oh, Butter is a necessity here. I've used Margarine, but it is not as tasty. So- Unsalted Butter it is! The dough is very sticky. For that reason I spread a little Butter on my hands before removing the dough from the bowl. The dough becomes easier to work with. For the recipe, click here. 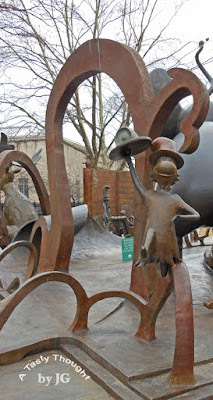 More of my hints are also included in this post that I wrote a few years ago. Usually, I freeze 2 slices for us to enjoy at a future date. That is a great find in our freezer! 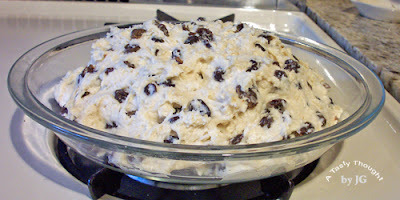 Bake an Irish Soda Bread using this recipe and you and your family will be very happy on St. Patrick's Day!! No need to buy one!! Preparing and then enjoying fresh veggie salads during the colder months seems so much more challenging than when fresh local colorful veggies are available in the summer. It may be because I like the taste of the fresh local tomatoes served over spinach leaves. Now that is a great salad when it has a balsamic vinaigrette drizzled over the top! All is not lost during the winter months in New England. Tasty baby spinach leaves are still available to purchase. With a few other staples in our pantry and fridge a great colorful salad is just minutes away! This is also quick and easy! Double plus!! 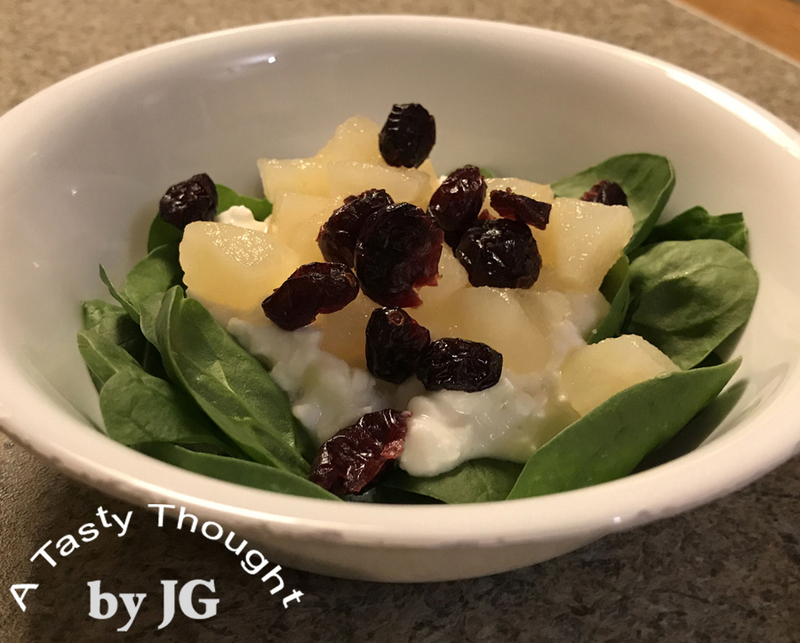 A dollop of cottage cheese (with or without pineapple chunks) placed on the fresh spinach leaves is just the beginning. Then, add a few chunks of a pear (fresh or canned) on top. Craisins (dried cranberries) are the last addition to this nutritious, colorful, flavorful salad. No dressing is needed! After enjoying this Winter Salad as part of our dinner last night, I definitely do not miss the fresh local tomatoes anymore. There will be plenty of them to enjoy in a few months! Visiting the The Amazing World of Dr. Seuss Museum and then the sculptures at the Springfield Museums in Springfield, MA is always FuN! 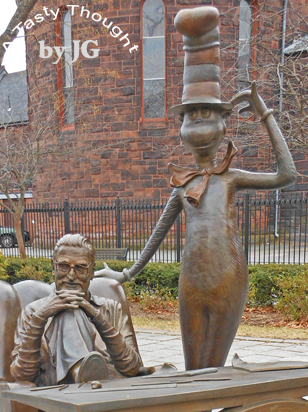 "The creator of these childhood favorites, Theodor Seuss Geisel, was born in Springfield, MA on March 2, 1904. Seuss was his mother's maiden name. 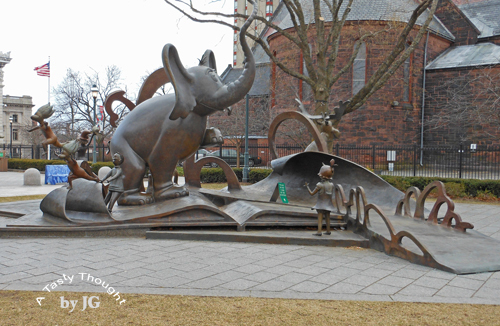 This author wrote so many wonderful stories for children (of all ages) using the name Dr. 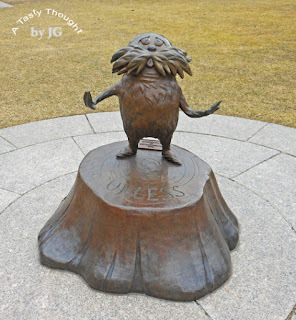 Seuss!" 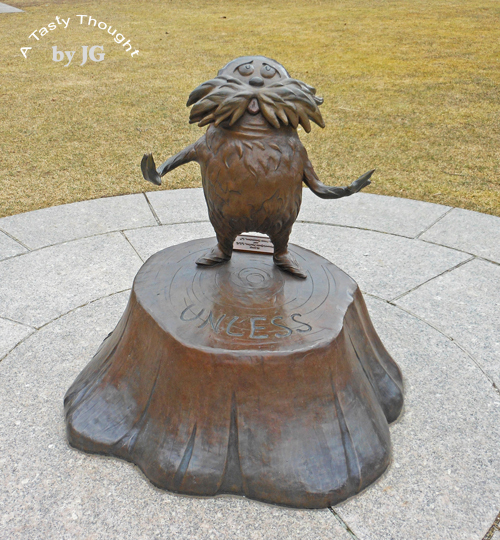 Thank you, Theodor Seuss Geisel for writing all of those wonderful stories!!! This view just never gets old. 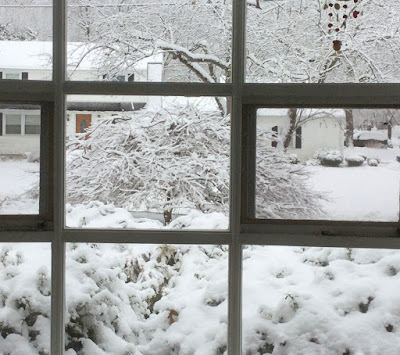 We had snow falling overnight and our magical view appeared- again. Snowflakes sitting on branches of the Japanese Maple and on the leaves of the bushes is so pretty. Well, not really!! Sometimes we hear the owls at night, but we have never seen one. That was until today! 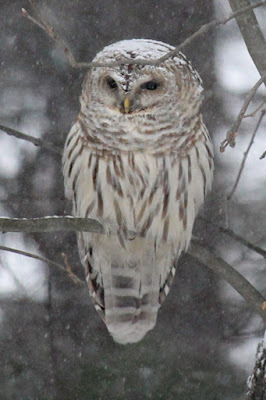 Very early this morning I glanced out our kitchen window and saw a baby owl on our deck. Now that was really cool! And very exciting!! 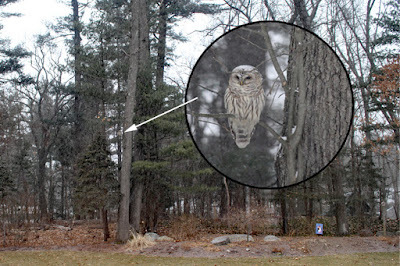 When I carefully returned to the window with the camera, the owl was gone. This afternoon it's been snowing. I was watching the snowflakes float down. While looking at the trees, suddenly an owl came into view! This owl was larger and perched on a branch. 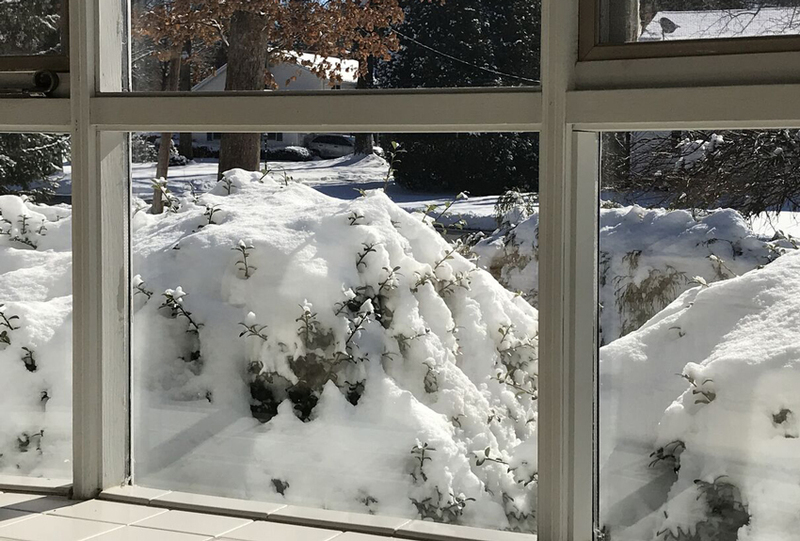 Every so often it would shake the snow off his head. It enjoyed its perch for quite a while. Suddenly, it was gone and then returned again to the same spot. What a very cool day I will not forget!! When it's chilly and we're wearing hats & gloves whenever we're outside, a large bowl of hearty soup is so yummy at dinnertime. Making a batch of soup is easy and I always enjoy the fact that I freeze the extra portions for other meals. 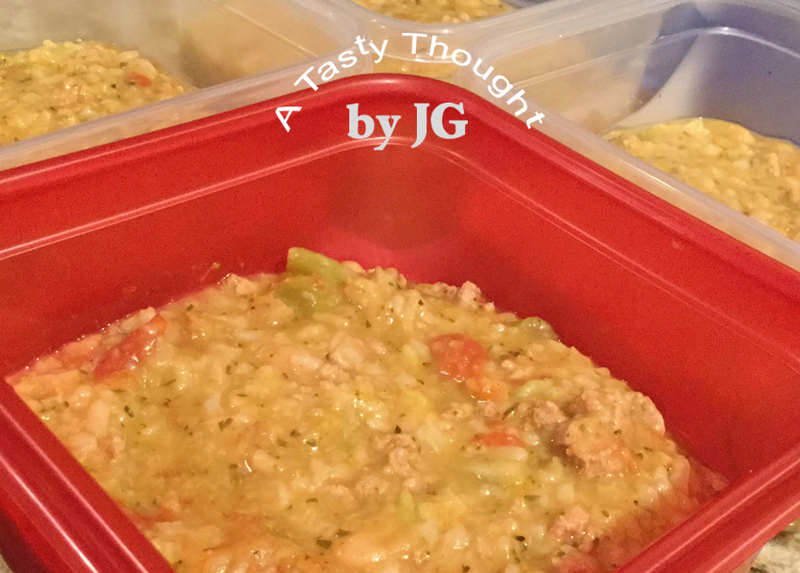 On another night taking a container of soup out of the freezer for dinner is even easier! That night was Saturday night! 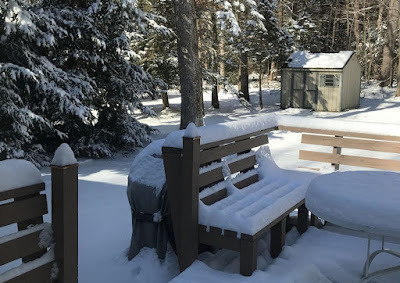 Earlier last week it was 63°F outdoors! I did write 63°F! What a change from cold with wind chill weather. Saturday the wind chill made it just outright frigid. Brrr! Bring out a bowl of hearty tasty soup. Turkey Veggie Soup is one of our faves! There are many spices to flavor the browned ground Turkey while this soup is really making itself on the stove. Last week while putting the ingredients together, I found there was no chopped Spinach in our freezer. Chopped Broccoli was a great substitute! We were really hungry at dinnertime, so there was no photo op of hot hearty steaming soup in bowls. The photo above shows the portions in freezer containers- getting ready to be placed in our freezer. When reheating it for dinner, I add about 2/3 of another can of Chicken Broth to the pot. Rice always absorbs the extra liquid, so more broth is needed when reheating. If you've never enjoyed this soup, make a batch. It is so good! Place in large pot or Dutch Oven. Add remaining ingredients to pot, stir. Bring to a boil. Reduce heat to simmer. Simmer about 45- 60 Minutes- until Rice and Carrots are cooked. Serve with a slice of Rye or homemade bread! A bowl of hot soup on a winter evening is so good! My freezer containers are always ready to pack away the extra portions. 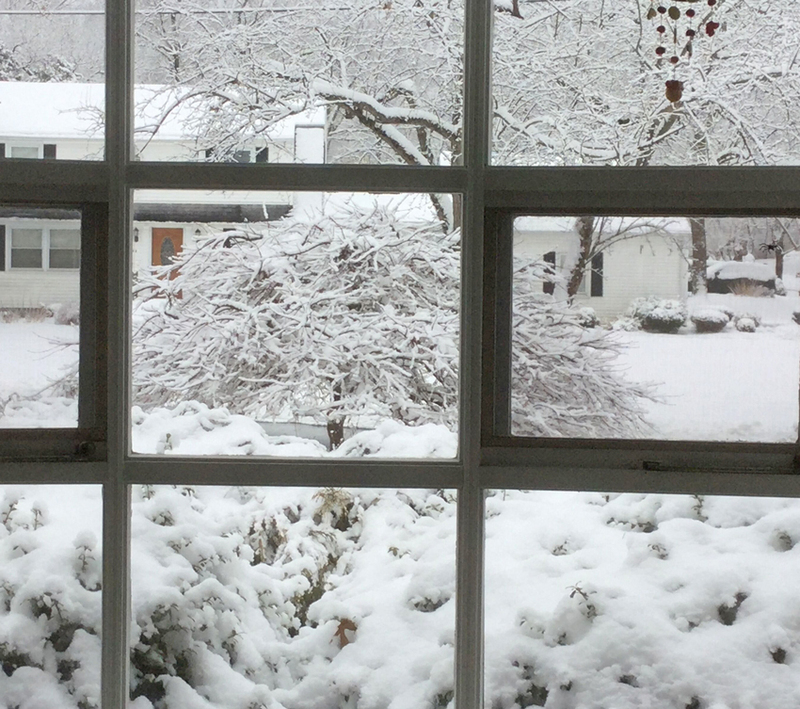 This morning we woke up to view the magic of winter surrounding our home. It was (is) a beautiful sight! For me our treadmill will come in handy for the daily exercise. It will also be the ideal time to bake a dessert to enjoy after dinner. It will be brisk in the next few days. It may seem that I have not been cooking very much in the past few months. Oh, that's not true. I've just not been blogging as much. There is one staple that we have quite often in our freezer. Belgian Waffles! Belgian Waffles made with buttermilk, egg whites and olive oil! On a cold winter morning it's great to take them out of the freezer and quickly microwave to enjoy for breakfast. Now, while preparing the batter I use a little less sugar, baking powder and baking soda. We do not prefer to have a lot of salt in the foods we enjoy, so I usually reduce it when cooking. Now, I also add (2 shakes each of) Cinnamon, Nutmeg and Cloves from my Spice Rack to the batter. 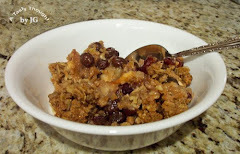 If I have an overripe banana in the fruit bowl, I mash it first and also add it in. They become Banana Belgian Waffles. With or without a mashed banana, Belgian Waffles are so yummy! Sometimes we enjoy them with defrosted strawberries and at other times with maple syrup! 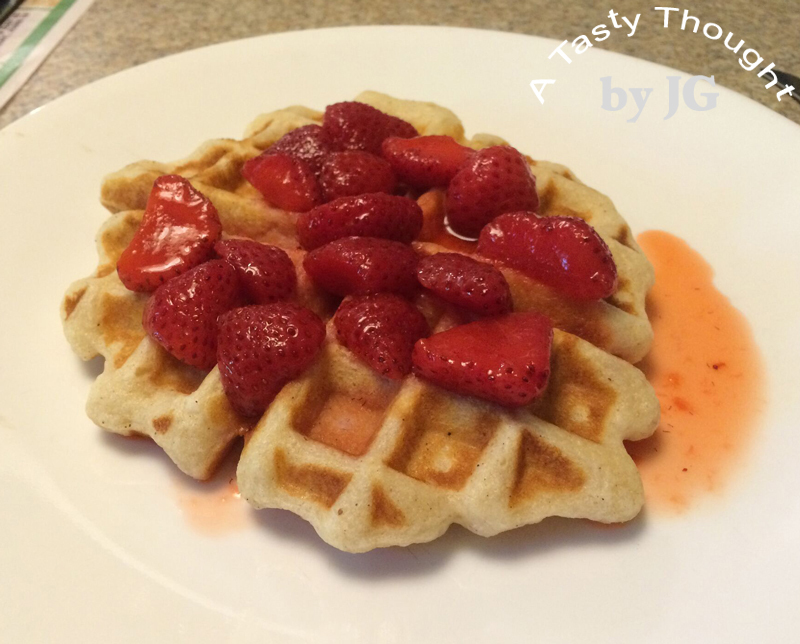 If you have not enjoyed them at breakfast for a while, put it on your list of things to do! In a smaller bowl beat 1 Whole Egg + 2 Egg Whites until well combined. Add Buttermilk (+ Milk if using), Olive Oil and Vanilla to beaten Egg + Whites. Combine. Stir together until almost smooth. Spray Belgian Waffle Maker with PAM before preheating. Spray only before making 1st Waffle. When Waffle Maker is hot, scoop 2/3 Cup batter to make Waffle. Close lid of Waffle Maker. Carefully open lid and remove. Continue until batter is used. 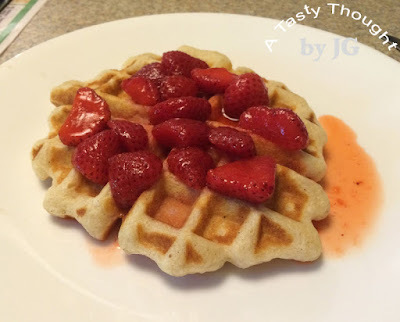 A Waffle at breakfast is so tasty! It is also quite filling. We do have remaining Waffles after breakfast. After they have cooled, I wrap each one in plastic wrap. Then, they are placed in a large freezer bag and stored in our freezer. Breakfast for other mornings!